Forks Meal Planner - Help & FAQ - Do I have access to previous meal plans? All Categories ​>​ Customizing Meal Plans ​>​ Do I have access to previous meal plans? Yes! You will always have direct access to your current meal plan and all previous meal plans you've acquired since you started your subscription. Additionally, you always access your Anytime Meal Plan/former Starter Plan (found at the bottom of the list). 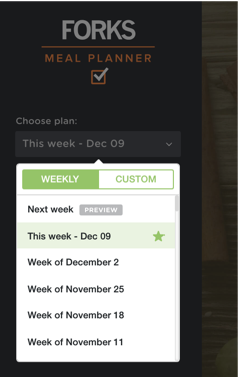 All meal plans will remain as you last customized them or in their default released form, if you didn't make any modifications. Some members prefer to download and/or print their meal plans. 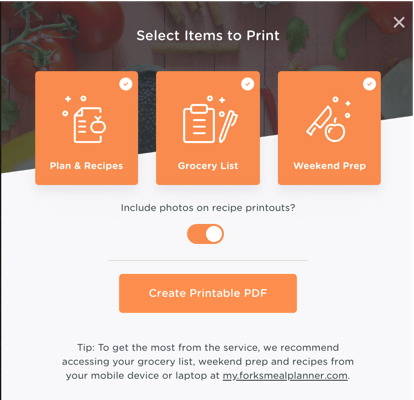 If you click download or print icon on the dashboard you will automatically be able to print everything you need for that week (menu, recipes, and lists).